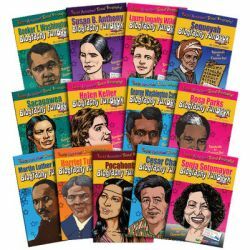 This series consists of Biography FunBooks that are fresh and exciting biographies filled with fun activities. They provide an overview of each person's life and touch on their childhood, education, family, personal obstacles and key accomplishments. The people selected for this set are the MUST READS that all students are required to learn. These new FunBooks are the best of both worlds: a fun read and reinforcing activities that cover all state and national standards.